For CS1 courses in Python Programming including majors and non-majors alike. A problem-solving approach to programming with Python. A book built from the ground up. This book is not a translation of a Java or C++ book into Python–it was written from the ground-up as a Python textbook. A focus on problem-solving with Python. 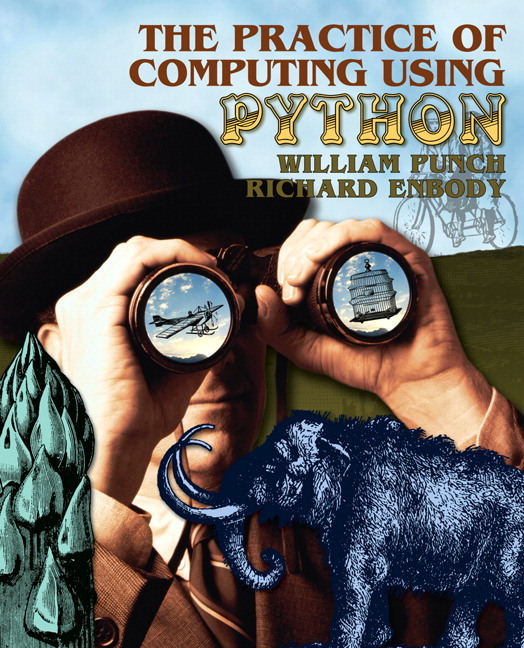 Three optional chapters in the book (3, 10, and 13) walk students through detailed examples of solving a problem using Python. In addition to design, they show mistakes and how to recover from them by illustrating the process of developing a solution. The authors also refactor some solutions as demonstrations of the importance of program design and readability. These chapters can be used in or outside of class, or in a lab setting. A data manipulation theme, supported by real-world examples and exercises. Students use Python to sort, apply, graph, and convert data. The authors have incorporated many real-world, mostly non-numeric examples with a gender-neutral appeal to support this theme: poker hands, Gettysburg Address, EPA mileage data, breast cancer classifier, speech analysis, political debates and S&P 500 analysis. The authors use objects and methods early while leaving the design and implementation of objects for later in the text--after mastery of the use of objects has been achieved. Strings covered early (before functions) to allow for more data manipulation to be done early. File I/O covered early for the same reason. Topics like plotting and drawing are included throughout the text in service of the data manipulation theme. Functions covered earlier; split in two parts. Only the string chapter separates the function and control chapter. Functions are split into two parts because of how Python handles mutable objects such as lists as parameters–discussion of those issues can only come after there is an understanding of lists as mutable objects. Reading from files appears early (chapter 4 Strings), even though a more complete discussion on files doesn’t happen until chapter 9. Students encouraged to use data structures as early as possible. For example, lists and strings show up before they are covered in detail. Dictionaries appear right after lists. In incorporating drawing and graphing, the authors use established packages instead of developing their own. One is built in (Turtle graphics in Python 2.6 or above, i.e. current versions), the other is widely used (matplotlib with numpy). Both are explained in appendices. The text is based on Python 2.x (for x >= 6) rather than Python 3.0 since the latter is not backward compatible with standard Python packages at this time. Differences are outlined in an appendix. Solutions to end-of-chapter Questions and Problems. A set of slides suitable for use in lecturing. 0.2.2 Difficulty 2: What is a good program? 0.3.3 Is Python the Best Language? 0.5 What is a computer? 0.8.6 What does a number represent? 0.8.8 How much data is that? 1.7.5 Augmented Assignment Operators: a shortcut! 2.1.3 Example: what lead is safe in basketball? 3.1 What is an algorithm? 3.2.6 Can we really do all that? 3.3 What is a program? 4.2.2 When is + addition and when is it concatenation? 5.1 What is a function? 5.3.6 What if there is no return statement? 5.3.7 What if there are multiple return statements? 6.1 What is a list? 6.8.2 What are some other example data structures? 7.2.3 Returning a complex object. 7.6 Esoterica: "by value" or "by reference"
8.4.2 What’s in a set? 9.1 What is a file? 11.1.1 Python is Object Oriented! 12.2 How does Python know? 13.5.1 Refinement: How many times to move? 16.4 How does recursion actually work? Richard Enbody is an Associate Professor in the Department of Computer Science and Engineering at Michigan State University. Since joining the faculty in 1987, he has served as Acting Chair of the Department, Associate Chair, and as Director of the Computer Engineering Undergraduate Program. Enbody received his B.A. in Mathematics from Carleton College in 1976, and spent six years teaching high school mathematics in Vermont and New Hampshire. He earned his Ph.D. in Computer Science from the University of Minnesota. Richard's research interests are in computer security, computer architecture, web-based distance education and parallel processing, especially the application of parallel processing to computational science problems. He has two patents pending on hardware buffer-overflow protection which will prevent most computer worms and viruses. In 1998 Richard pioneered a CS1 course (first course in Computer Science) over the World Wide Web using RealVideo synchronized with PowerPoint. Students from as far away as Russia and Korea enrolled in the course. When not teaching, Richard plays hockey, squash, canoes, backpacks, as well as a host of family activities. Bill Punch is an Associate Professor in the Department of Computer Science at Michigan State University as well as the director of Michigan State's High Performance Computing Center. Punch is co-director of the Genetic Algorithms Research and Applications Group or GARAGe. His main interests are genetic algorithms and genetic programming, including theoretical issues (parallel GA/GP) and application issues (design, layout, scheduling, etc.). He also has conducted active research in data mining, focusing on the use of ontologies such as WordNet and Wikipedia for text search.